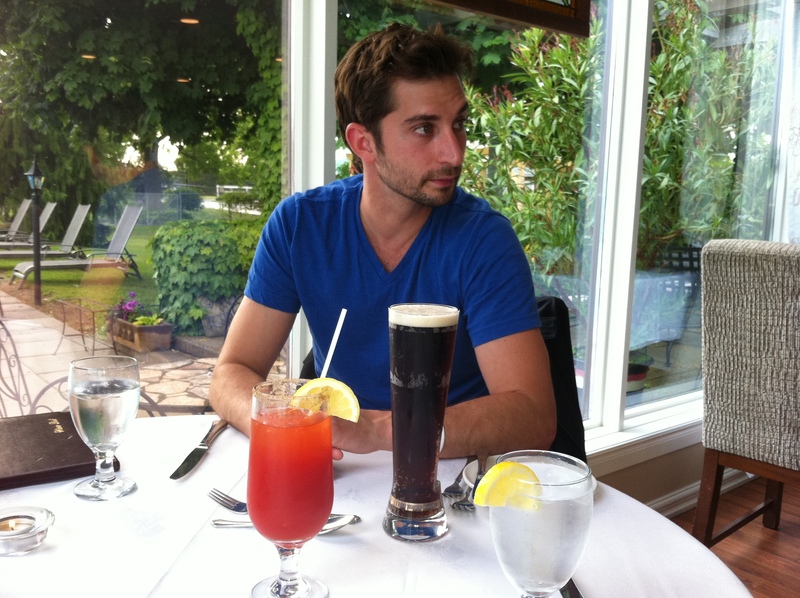 On Thursday night, or “date night” for my dear friend and I, we decided to go for some good old fashion German food at Hessenland in St. Josephs. 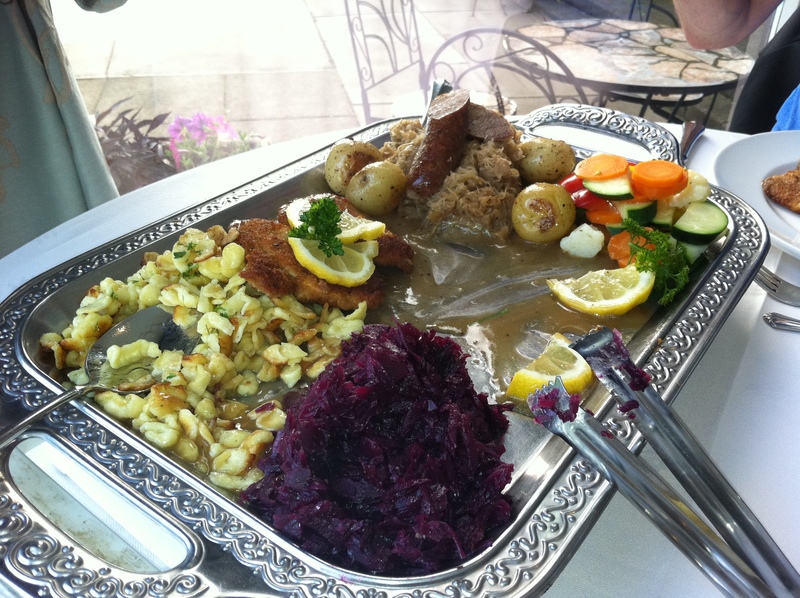 In all honesty, I have not eaten a ton of German food in my past, so I was really excited to check it out. Firsts things first, Hessenland is absolutely beautiful! The gardens, the bar, the restaurants, the pool, everything! It is just an all around beautiful place. This is the view from our table, how could you be anything but relaxed. 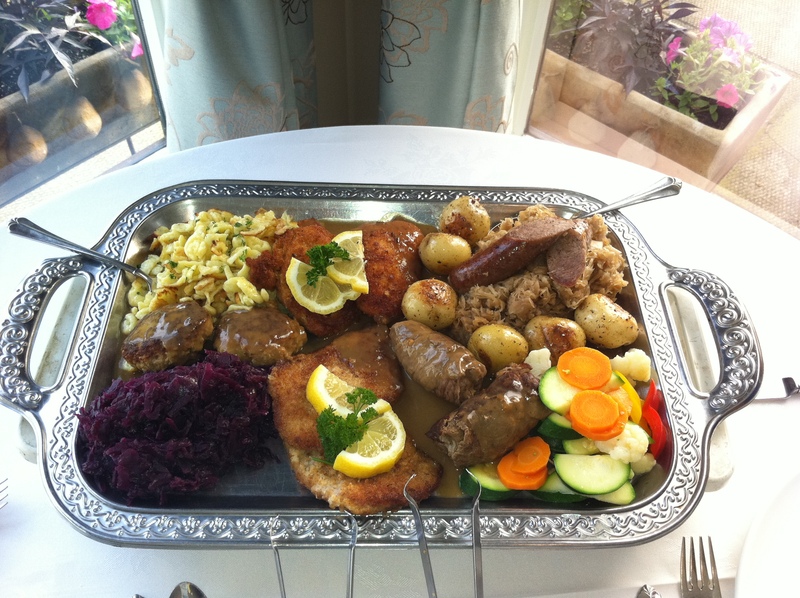 We decided that if we were going to eat German, than we must go all the way, so we ordered the platter. Which was HUGE might I add, but so worth it. It had everything and more! Beef Rouladen , Holsteiner Schnitze, Pork Schnitzel, Wurstplatte, potatoes, braised cabbage.. and more, I just cant remember the rest! But it was all so so so good! i had to put this pic up, he just looks so darn cute! this is what we had for a starter. It was white bean hummas, and it was delicious! This is the amazing platter!!!! and this is the point where we started getting full!!! Left overs woohoo!!! Originally when we planned to go to Hessenland we wanted to go to the Mongolian Grill night which they have every Thursday. Unfortunately it starts next week, OH DARN, ill have to go back! 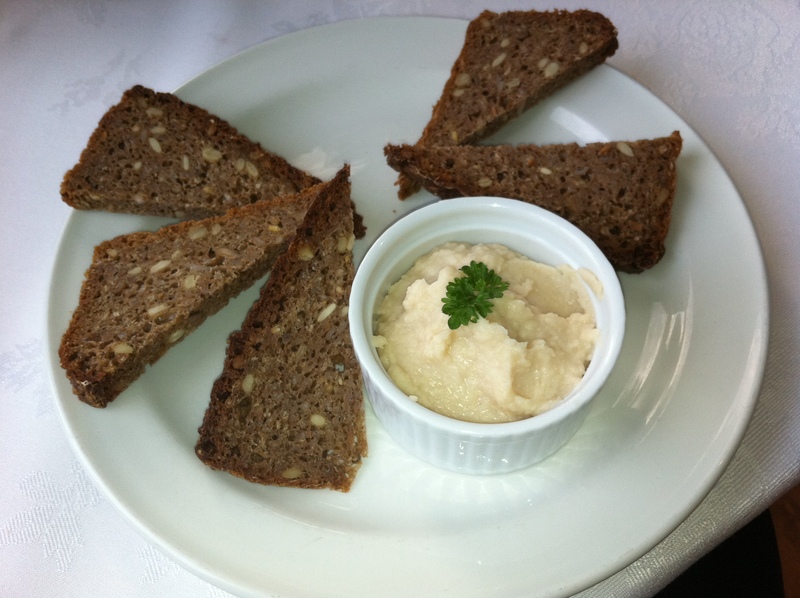 I recommend if you are looking for some culture in your food to head to Hessenland, it was delicious and traditional. Love love their german food! Mongolian Grille is amazing too! Either way you can’t go wrong at Hessenland! Now you just need to get behind a German motor product (BMW… **cough, cough**), and you’ll have the entire German experience. Great post, Kaylie. Keep bloggin’! hello i convinced my boyfriend to get the X5, I am already on board babycakes!